Last month, Tory Lowe walked from Milwaukee to Chicago to address ‘black-on-black’ crime, extending the mileage on this tortured phrase. 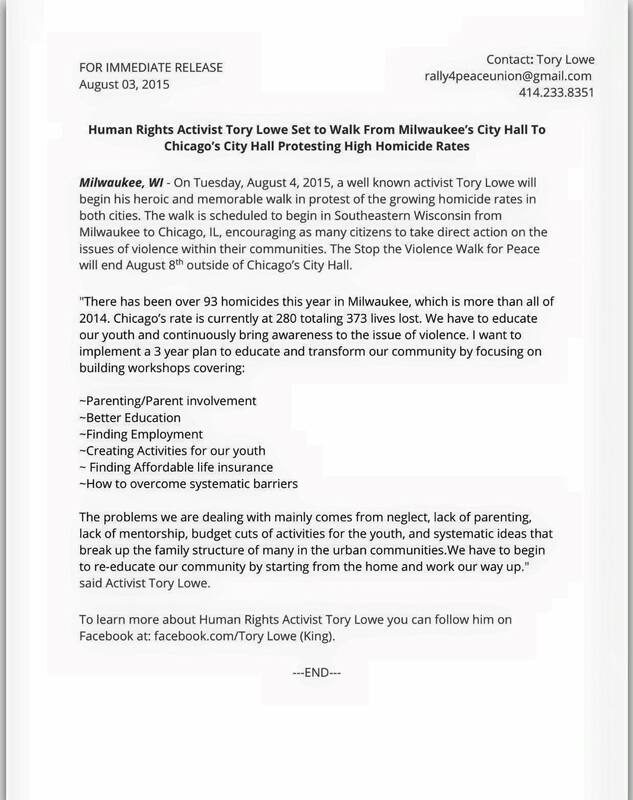 Last month, Milwaukee activist Tory Lowe walked from his local government’s city hall to Chicago’s city hall in protest of the rising homicide rates we all keep reading about. Whether such upticks are a disturbing trend or an anomaly in the larger scheme of things, communities are seeking answers for how to live with increased violence today. Last week, Chicago suffered its deadliest day in 12 years when eight people were shot, each of them in different districts across the city. It’s stories like this that ignited Lowe’s “Stop the Violence Walk for Peace,” which took him five days to complete. The phrase “black-on-black crime” is a troubling, and rather hackneyed term. Given that Lowe used it when speaking with Urban News Service, which caters to black news outlets, it could be that he was using it with his “inside voice”—conveying concerns in terms that resonate within black communities. Still, Lowe’s “black-on-black crime” justification arrives at a time when the Black Lives Matter movement is trying to direct attention to the wider systemic practices that result in violence against people of color. That movement is already getting cast by conservatives as a “hate group,” and by others as a network that’s working against liberal would-be allies. Most distressingly, language like “black-on-black crime,” which suggests these problems are purely of African-Americans’ own making, could undercut the agenda to reform flawed urban policies. A recent Rasmussen poll of 1,000 adults found that 78 percent of all voters preferred the term “all lives matter” over “black lives matter”—as did 64 percent of black voters polled. Rasmussen also reported this year, however, that a slight majority of African Americans polled (56 percent) viewed police discrimination as a bigger problem than “inner-city crime”— at odds with 78 percent of white voters and 54 percent of “other minority voters” who saw “inner-city crime” as the bigger problem. Terms like “black-on-black crime,” which have been around since at least the 1970s, often let police and policymakers off the hook in these discussions. Lowe isn’t trying to let anyone off the hook, though. Definitely not the police. When I ask him about recent efforts to beef up police presence as a way of mitigating violent crime, he laughs. Hoffman interpreted whites’ self-destructive behavior as a consequence of a diseased society, not of a “diseased manhood and womanhood.” White criminality was a response to economic inequality rather than a response to a “race proclivity.” On the white side of the color line, it would take nothing short of “emergency measures’ to save modern civilization from itself. This bidirectional advocacy in many ways reflects the nation’s handling of the recent uptick in heroin abuse, seen most vividly these days among white suburban residents, compared with how the nation handled crack abuse in black communities in the 1980s. When her husband Bill Clinton was president, the federal government addressed drug and alcohol addiction by investing in prisons, decimating millions of already unstable black families in the process. In Lowe’s three-year plan to cut violence in black communities he lists “creating activities for our youth” and “overcome systematic barriers.” But he also lists “better parenting,” a prognosis that’s usually lumped in with the “black people are their own problem” category. From our talk, though, it was clear that his focus, and what he learned from his walk, was on the systemic problems.